In 1865, Wilhelm Knoll sets up a "leather business" in Stuttgart, Germany. The grandfather of the Knoll dynasty makes seating and upholstery of exceedingly good quality at his works. The craftsmanship of his goods is such that he is appointed "Supplier to the Court" of the Württemberg monarchy in 1900. The post-1871 'Wilhelminian period' sees furniture designs incorporating everything from Gothic to Baroque. As in architecture, a strict division is made in interior design between the engineering and looks of a piece. Furniture is still largely made by hand. In this period, Wilhelm Knoll fuses the crafts of upholsterer, joiner and saddler into a masterful unity. In 1907, his sons Wilhelm and Walter take over their father's business. They remain committed to the ideal of crafted quality. 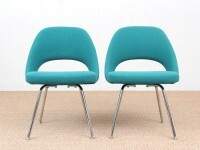 At the same time they begin looking round for new forms and functions for their seating. It is this pioneering spirit that leads Walter Knoll to the USA in 1921. The emergence of Modernism, the First World War, the Weimar Republic and rampant inflation also call for new solutions in the design of domestic furniture. 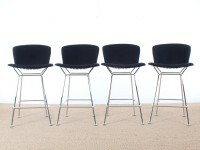 Wilhelm and Walter Knoll take ideas from architect friends on board. They consciously say goodbye to staid leather armchairs, incorporate the functionalist formal language of the age into their designs, and highlight these by means of colourful fabric covers. In 1925, Walter Knoll returns from the USA. Inspired by the culture and art of the New World, he sets up his own company, Walter Knoll & Co. GmbH. In 1937, said company moves to Herrenberg. Shortly before the Second World War, Walter Knoll's first son Hans likewise makes off for North America, where he founds Knoll International. The steel-tube furniture of Marcel Breuer, Mies van der Rohe and Mart Stam echo the zeitgeist. Wilhelm Knoll's designs are geared towards the avantgarde furniture system for the Weissenhof Estate built at Stuttgart in 1927. His Antimott programme replaces springs and plush upholstery with elastic straps boasting fine suspension properties. One example of truly pioneering work are the aluminium chairs for the Zeppelins. 1950 marks a new beginning after the break of the Second World War. The Cologne Furniture Fair, being held for the first time, represents a breakthrough for the Walter Knoll company. The market is there for the taking. In 1964, Walter Knoll's second son Robert takes over a flourishing business that has grown considerably. Organic forms are typical of the Fifties. Kidney tables and bag-shaped lamps are mass-produced for the tiny flats of the postwar era. New synthetic materials and new methods of working wood and metal make it possible to forego symmetry and right angles. The company helps shape the current trend. With funnel-shaped bucket chairs, upholstered chairs with elliptical seats, or cocktail chairs with curvaceous contours. In 1974, Walter Knoll products are shown at the Milan Fair for the first time. Major large-scale orders vindicate the firm's strategy. The office furniture business gains in significance under the Walter Knoll Office label. 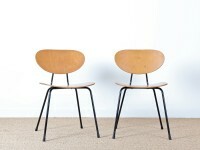 The Wilhelm Knoll company is taken over by Walter Knoll & Co. in the mid-80s. Seventies interior decor is characterised by easy-going informality. Attributes that lead to an untidiness in the 80s that just may be deliberate. Walter Knoll always factors in the predilections of the age, simultaneously transcending them by dint of formal excellence. An endlessly extendable lobby-seating system is designed for Berlin Tegel airport in 1975. Developments in the office sphere culminate in 1988 in the Primo collection, which transplants the principles of domestic furniture design to the workplace.